Vaisnav Saint of Assam Mahapurush Srimanta Sankardeva was born in 1449 into Baro-Bhuyans family near at Aali-pukhuri, about 8 miles to the west-north-west of Bardowa situated in the Nagaon district of Assam. The Baro-Bhuyans family were independent landlords in Assam, and belonged to the kayastha Hindu caste. Srimanta Sankardeva's father was Kusumvar Barbhuyan and mother Satyasandhya Devi. Sankardeva lost both his father and his mother at a very early age and was raised by his grandmother Khersuti. He began attending the tol or chatrasaal (school) of the renowned scholar Mahendra Kandali. He started schooling at the age of 12. He was a child prodigy who showed his intellectual brilliance at an early age. At the age of 12 ahe wrote his first verses: karatala kamala kamaladala nayana......The complete poem was written before he was taught the vowels except, of course, the first one, and is often cited as an example of the early flowering of his poetic genius. He could swim across the Brahmaputra while it was in spate. He left the school in his late teens (1470) to attend to his responsibilities as the Shiromani Bhuyan. He moved from Alipukhuri to Bordowa, and wrote his first work, Harishchandra upakhyan. Sankardeva produced a dance-drama called Cihna yatra, for which he painted the Sapta vaikuntha (seven heavens), guided the making of musical instruments and played the instruments himself. At Bordowa, he constructed a dharmagrha or a Hari-grha (house of the Lord) in which he installed an image of Vishnu that was constructed out of a huge piece of wood which he found floating in a river ,after he got a divine vision of it during the construction of the grha. But it was not meant for worshipping; it was just a "showpiece of art work". In fact, he was absolutely against any kind of worshipping of Idols or Images of gods. He married his first wife Suryavati when he was in his early 20s. His wife died soon after his daughter Manu was born. It is possible the death of his wife increased his spiritual inclination as his mind began to focus, more than ever before, on the transcendental. When his daughter turned nine, he married her off to Hari, handed over the Shiromaniship to his grand uncles and left for a pilgrimage (a religious tour rather) (c1482). At this point of time, he was 32. The pilgrimage took him to Puri, Mathura, Dwaraka, Vrindavan, Gaya, Rameswaram, Ayodhya, Sitakunda and almost all the other major seats of the Vaishnavite religion in India. At Badrikashrama, he composed his first bargeet—mana meri ram charanahi lagu—in Brajavali. He returned home to Ali-pukhuri after 12 years (his family had moved back from Bordowa in his absence). During his pilgrimage, he witnessed the Bhakti movement that was in full bloom in India at that time. After his return, he refused to take back the Shiromaniship. On his grandmother's insistence, he married Kalindi at the age of 44. Finally, he moved back to Bordowa and constructed his first naamghar (prayer hall), and began preaching. He wrote Bhakti pradipa and Rukmini harana. Soon after, he received a copy of the Bhagavata Purana from Jagadisa Mishra of Tirhut, Mithila which had in it commentaries from Sridhara Swami of Puri, an Advaita scholar of Orissa, and began rendering it into Assamese. He also began composing the Kirtana ghosha. The 13 years at Ali-pukhuri was the period during which he reflected deeply on Vaishnavism and on the form that would best suit the spiritual and ethical needs of the people. From Ali-pukhuri he moved again to Gajalasuti and then back to Bordowa. In the mean time the Bhuyans were getting weak politically and Bordowa was attacked by the neighboring tribes. Shankaradeva had to move again from place to place. At Gangmau he stayed for five years where his son Ramananda was born. While at Gangmau, the Koch king Viswa Singha attacked the Ahoms. The Bhuyans fought for the Ahoms and the Koch king was defeated. Due to the unsettled situation at Gangmau Sankaradeva next moved to Dhuwahat, present day Majuli, now an island on the Brahmaputra. At Dhuwahat, he met his spiritual successor Madhavadeva. Madhavdeva, a sakta, got into a religious altercation with his brother-in-law Ramadasa who had recently converted to Vaishnavism. Ramadasa took him to Shankaradeva, who, after a long debate, could finally convince him of the power and the efficacy of Naam Dharma. At Dhuwahat he initiated many others into his religion and continued composing the Kirtana ghosha. He tried to appease the brahmans by gentle persuasion and debate, but they felt threatened by the emergence of a new religion propagated by a non-brahmin. Some brahmans submitted a complaint with the Ahom king Suhungmung, who summoned Shankaradeva and Madhavadeva to court. They gave adequate replies to the royal queries and were let off. Though the relationship with the Ahom royalty began cordially, it soon deteriorated. Once on the charge of dereliction of duty, Hari, Shankaradeva's son-in-law, and Madhavadeva were arrested and sent to the capital Garhgaon, where Hari was executed. 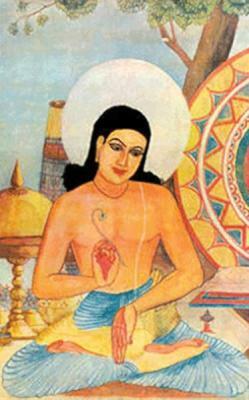 Madhavadeva's life was spared but he was imprisoned for a year. This incident pained Shankaradeva much and he, along with his family and Madhavadeva, journeyed toward the Koch kingdom. At Dhuwahat, he wrote the drama Patniprasada. For him the worship of the idols of numerous gods and goddesses were unnecessary as the same supreme soul exists in all human beings. He taught that devotion, not salvation is the aim of all human life. He also opposed vehemently all class distinctions and man-made social barriers. Ultimate emphasis was placed on singing and reciting of Bhajans. For this purpose, he wrote a book named' Kirtan Ghosha' which till today has remained a priceless gem of Vaishnava thoughts. In the task of establishing the new faith, he was helped by his disciples named Madhabdev, Damodar Dev, Haridev, etc. After a great deal of moving, Shankaradeva settled at Patbausi near Barpeta and constructed a Kirtanghar (house of prayer). Some of the people he initiated here are Chakrapani Dwija and Sarvabhauma Bhattacharya, brahmins; Ketai Khan, a kayastha; Govinda, a Garo; Jayarama, a Bhutia; Murari, a Koch and Chandsai a Muslim. He also befriended Ananta kandali, a profound scholar of Sanskrit, who translated parts of the Bhagavata Purana. Damodardeva, another brahmin, was initiated by Shankaradeva and he later became the founder of the Brahma Sanghati sect of Shankaradeva's religion. On hearing complaints that Shankaradeva was corrupting the minds of the people by spreading a new religion, Naranarayana the Koch king, ordered Shankaradeva's arrest. Shankaradeva managed to go into hiding, but Narayan Das Thakur Ata and Gokulchand were captured. They were taken to Kochbehar and subjected to inhuman torture, but they did not divulge the location where their Guru was staying, and the royals soon gave up. In 1568, after leading a most eventful life dedicated to enlightening humanity; the Mahapurusha died – within six months of his stay at Bheladonga – at the remarkable age of 120 years. Eka-Sarana : Sankaradeva propagated a form of Vaisnavism known as Eka-Sarana-Hari-Nama-Dharma, popularly referred to as 'Mahapurusism', which considers Lord Krishna to be the One, Eternal and Absolute and stresses upon unqualified devotion to Him. He spread the liberal and humanistic doctrine of bhakti for the very first time in Assam. The religious system of Sankaradeva is strictly monotheistic and the worship of deities other than Krishna is strictly prohibited. Sankaradeva was the fountainhead of the Ankiya naat, a form of one-act play. In fact, his Cihna Yatra – staged by him when he was only 19 – is regarded as one of the first open-air theatrical performances in the world. Cihna yatra was probably a dance drama and no text of that show is available today. These cultural traditions still form an integral part of the heritage of the Assamese people. Songs : The Borgeets (literally: great songs) are devotional songs, set to music and sung in various raga styles. These styles are slightly different from either the Hindustani or the Carnatic styles. The songs themselves are written in the 'Brajavali' language. 1) Sapta vaikuntha – part of the Cihna yatra production, does not exist today. 2) Vrindavani vastra – parts of this work are preserved in London. Srimanta Sankaradeva Sangha : The Srimanta Sankaradeva Sangha, established in 1930, is the largest socio-religious organization in Assam. Its roots may be traced to the early 20th century when the great Sankaradeva Movement, afflicted with several ills, was in urgent need of reform. Primary focus of the Sangha remains on the propagation of the pure creed of Sankaradeva at the grass-roots level, putting an end to all class and caste distinctions along with other obscurantist practices and of course putting an end to the religious distortion of the Vaisnava faith. These are the ideals which drive the Sangha in its endeavour to build a robust and healthy society in Assam, marching forward in every sphere - the vision of Srimanta Sankaradeva. Srimanta Sankardeva Kalakshetra : The Srimanta Sankaradeva Kalakshetra has been conceived as a grand exposition of the life and culture of the people of Assam, of its diverse ethnic groups and sub-groups who have created the cultural mosaic which is the essence of the State, in all its beauty and splendour. Named after the great unifier of Assam and one of the greatest integrators of the Indian society of the fifteenth century, Srimanta Sankaradeva, the Kalakshetra attempts to capture and convey the essence of the great seer’s spirit, who preached the message of unity in diversity, sang the song of glorious Bharata-Varsha and the universal brotherhood of man. The institution attempts for the preservation, restoration, research, promotion and development of the rich cultural heritage of the diverse ethnic communities inhabiting Assam.